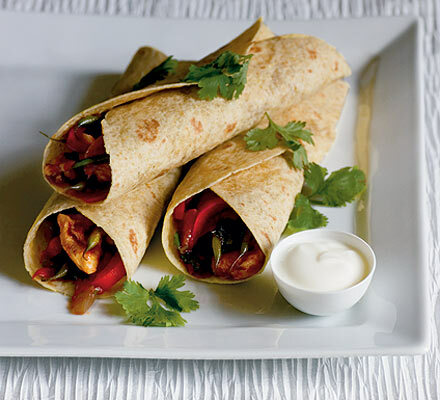 Chicken fajitas with marinade and seasoning sauce. Cut the chicken into small strips, none longer than two inches, about 1/4 inch thick. Combine fajita seasoning with water, vinegar, and lime juice in a small bowl. Marinate chicken in above mixture, covered and refrigerated, for a couple of hours. Cook marinated chicken strips in a wok over medium heat until brown. Use cooking oil to prevent sticking. Add green pepper and onion, and stir fry for about 1 minute. Add remaining marinade and stir fry until liquid is gone. Spoon 1/4 of the mixture into the center of one flour tortilla and add 1/2 slice cheese. Sprinkle with a dash of your pre-mixed fajita seasoning. Fold like a burrito with one end open and wrap in a 12x12 sheet of wax paper. Let sit 5-7 minutes. Microwave, still wrapped, 15 seconds each.